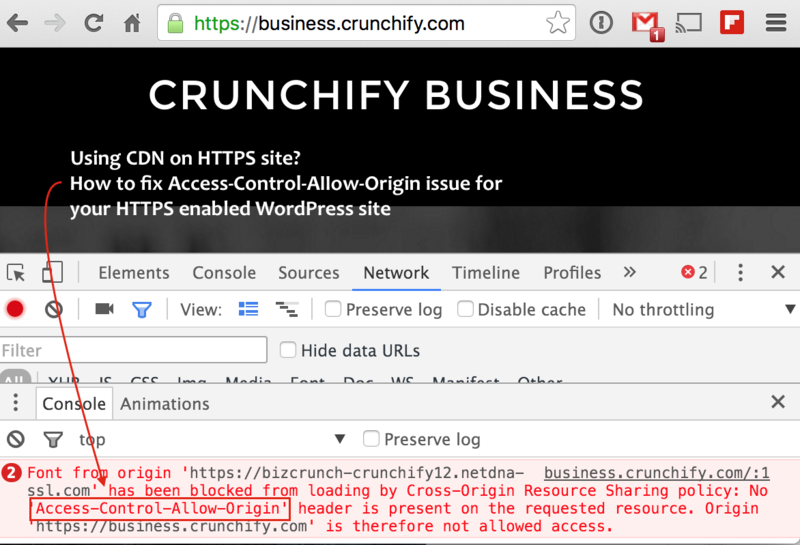 On Crunchify Business site we have enabled HTTPS from day one. Recently WordPress.com announced 100% HTTPS enablement even for hosted domains at WordPress.com and that’s a great news. While setting up HTTPS on WordPress site, we found a strange issue by looking at Chrome console output. Take a look at below screenshot. Error: No Access-Control-Allow-Origin header is present on the requested resource. First of all I’ve never seen this before for any WordPress site. Using web.config and Java setting combination you could fix CORS origin issue easily. Let’s understand what is Cross-origin resource sharing (CORS)? Now your web browser makes call to Domain2. In simple statement: If request is not coming from same domain or origin, just simply ignore it. This is very important features which prevents hacking and resource stealing without owners’s knowledge. Mixed Content: The page was not loaded over HTTPS. This request has been blocked. Why problem appeared on Crunchify.com site? 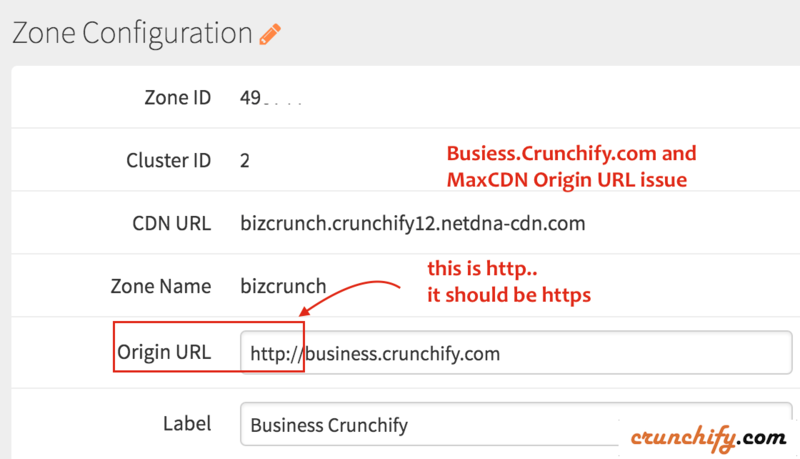 After investigation I came to know that I’ve setup http as my origin URL in MaxCDN setup admin console. It should be https. How did I fix this error? Just changed Origin URL from http to https and issue resolved in my case. There is another way to fix an issue too. Are you using Webfonts from Google, Typekit, etc? There are multiple ways you could use Webfonts like @font-face or CSS3 methods, some browsers like Firefox & IE may refuse to embed the font when it’s coming from some non-standard 3rd party URL (like your blog) for same security reason. In order to fix an issue for your WordPress blog, just put below into your .htaccess file. As you see Access-Control-Allow-Origin "*" allows you to access all resources and webfonts from all domains. Just add below lines to .htaccess file and we should be good. Header set Access-Control-Allow-Headers: "Origin, X-Requested-With, Content-Type, Accept, Authorization"
Hope this helps you the way you want. What is Cross-Origin Resource Sharing (CORS) – How to add it to your Java Jersey Web Server? Failed to load https: //r12---sn-aigllnd7. googlevideo.com/videoplayback?' has been blocked by CORS policy: No 'Access-Control-Allow-Origin' header is present on the requested resource. Origin 'https://ytthum.000webhostapp.com' is therefore not allowed access. 🙂 thank you. that code helped. Thanks Alan for nice words. Appreciate your feedback. We will try our best to continue providing best tutorials. Thank you so much you solved an issue i was bugged with for a few weeks had to hit it from the right angle youre a lifesaver! You are welcome Venus. Happy Blogging. Thanks. Great Article. You are ONE AWESOME ! Thanks Joel. You are welcome. For me its not working been using cloudflare with cbname and maxcdn with wp rocket everytime I turn on the cdn on wp rocket with maxcdn I get the font errors, I have inserted that code and also the ones at https:// http://www.maxcdn. com/one/tutorial/how-to-use-cdn-with-webfonts/ and nothing still the same can anyone help? Hi Benjamin – could you share your site URL? Would like to see an error. Might be some minor setup glitch. Thanks a million!!!!! This was the best explanation and fix! Well done! Brilliant! Just the solution I needed! Been wondering about this for a week or two. Used your fix but only one of two was fixed. Both were issues with fontawesome fonts. edit: I f5’d, ctrl f5’d and nothing. Left it for a minute or two and it’s now resolved itself, apparently. We shall see. Good to hear that Robert. I’m glad it worked for you and thanks for an update. Thanks, dude! The .htaccess solution helped me. Good to hear that. Happy blogging. where we can find .htaccess file? Hi Sireesha – you could find .htaccess file under /public_html/ folder 99% of the time where your WordPress site is. If you have your blog somewhere in other folder then you could create one .htaccess at WordPress site’s root folder.